Kiev: Does your car have DC quick charge, level 3 charge port? Yes, it does have DC quick charge, and we are considering borrowing a CTEC CHAdeMO charger from someone here in Sydney, and seeing if we can put charge in that way. We will however still need to charge the 12V battery separately since it currently does not charge from the battery or 240V. This will give us plenty of electrons to get the car out to our new home. We will probably import a DC/DC Converter from a wrecked car in Japan, and swap out the top board to see if that fixes it. If not, then we will probably sell parts or the whole car as is. kiev wrote: Howdy Mike, welcome to the miev forum. Hi. I may be starting an interest in iMievs, for a colleague. Yes, that clinches it. Now I'm thinking that electronpusher's "resistors" may have been surface mount versions of those Y capacitors. They all look much the same when burned. Is this possible, @electronpusher ? With the chargers seemingly so voltage agile, I can't see any reason for resistors in one model and capacitors in another. Maybe they changed the circuit, perhaps for reliability problems. So I agree that swapping the bottom board should be ok. Weird that the mains conditioning is on the DC-DC board though. I guess it's just where it fitted. Edit: some more thoughts. It looks to me now that both the charger and the DC-DC are on the bottom board. That's why the mains goes there. The mains comes in on two orange wires (with active marked as black, the US convention, and strange to we Aussies where black usually means neutral), and the charger output (to the battery) goes out on the other two orange wires at the bottom of kiev's photos. There is a green there too (hopefully with a yellow stripe) that goes to ground/earth/chassis. So the top board seems to be all control logic, plus half the mains conditioning: fuse, surge arrestor, X capacitor and bleed resistor (which doesn't seem to be visible under the potting, but you can see its symbol under the PCB), and three movistors (MOVs, Metal Oxide Varistors, which are voltage dependent resistors, basically more surge protection). The surge arrestor appears to be in series with two of the MOVs, one each to active and neutral. So actually, electronpusher, there is a fair bit of protection on the mains side. I'm moderately impressed. The potting seems to be to keep dust and grime (even though this box is probably sealed) from making paths for the higher voltage, and to keep high voltage parts and tracks away from fingers. It also has the effect of mildly frustrating repairers, but safety and longevity are obviously more important. Electronpusher, does your surge arrestor (designated "SA" on the top board) look as-new as does Kiev's? Another thought: perhaps "soot from resistor" is actually arc flash from inside. I've seen this with Elcon chargers. Is that possible? Last edited by coulomb on Tue Jun 12, 2018 6:42 am, edited 1 time in total. It's a dual function box--it does both the dc/dc for the 12V, and the ac/dc for the pack charging. Here's what i think we are looking at: the 3 big electrolytic caps and coil at the rear of the box (bottom edge of picture) are the rectified dc buss , the diode bridge and FETs for PFC are mounted to the water-cooled heatsink underneath the board, as are the PWM boost FETs, and the output cap and coils are toward the front (top edge of photo). In the scorch picture, the fat shiny orange cable harness runs from this box to the pack terminals inside the motor inverter located to the right. So there is HV when the pack contactors are closed, either for charging or in READY drive mode. Quite possibly, won't be able to check that for a while though as it is all back together now so we can drive it out to our new home. Out there we intend to remove it again, and we'll clean up the soot from that area, and see if I can make out any markings on the remaining component. I also agree that there would be no reason for them to be resistors, if other models have caps, so my assumption now is that they are resistors. It may be repairable yet. The concern I have with protection on the mains side is that it is all contained in this one $4000AUD box, which if a surge does occur, they want to replace the whole thing. With an EVSE the cost is cheaper for replacement. As with the soot, I guess it could be HV discharge, but the only thing it would have discharge to was the relay next to is, as there is not burn marks anywhere else. Kinda hard to say. electronpusher wrote: It may be repairable yet. True. But unfortunately after a massive transient like that, blowing some parts to soot, it's likely that there is damage to other parts of the circuit. As with the soot, I guess it could be HV discharge, but the only thing it would have discharge to was the relay next to is, as there is not burn marks anywhere else. I don't think it was flash-over; it seems more like a massive overload. I mean to say that the discolouration on the relay might be from internal arcing of the contacts, rather than external deposition from the blown components. When you get to it again, it would be good to distinguish between those two. If the relay opened under load, which could happen if it lost power, then there is significant current in the Power Factor Correction inductor. This is also seen if you disconnect power to an Elcon charger when they are charging at full output. Inductors don't like to have their current changed instantly, like from 14 A RMS (so around 20 A peak) to zero. If you try, then they develop high voltage (of the order of kilovolts) to try and keep the current flowing. 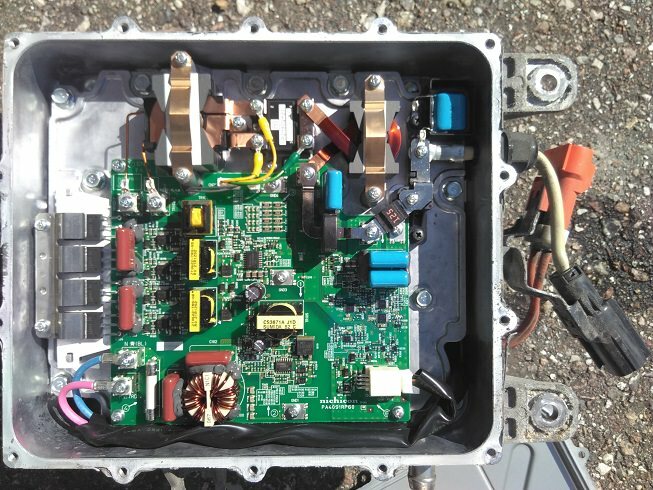 This is likely to take out the X and Y capacitors we've been talking about, but unfortunately also the bridge rectifier, the PFC MOSFETs (they could be IGBTs), and some snubber components. Oh, duh. I've just realised that the input relay likely has the same function as on the Elcon EV chargers: to short out the pre-charge resistor. One of the large white vertical power resistors could be the pre-charge resistor. Though it is on the wrong side of the common mode choke. I'm thinking now that on some models, the pre-charge resistor is a through-hole component under the potting mix, and on others like electronpusher's, it's an array of larger surface mount resistors on a small daughter board. So the soot may have come from resistors after all. It's quite common (perhaps 30-50% of cases) for the pre-charge resistors on an Elcon charger to be burned up or high or low (!) resistance. Any time that the input relay opens under load, if it has the pre-charge resistors across its contacts, the pre-charge resistors will attempt to take full load current, possibly full mains voltage if there is a short circuit or near short further down. They often fail in spectacular fashion. Perhaps electronpusher's Y capacitors are smaller, kiev's capacitors have longer pigtails, so the tops of these capacitors isn't visible above the potting. Then there is the reason that the input relay opened under load. If you don't recall switching off the charger at the mains (as opposed to getting the car to switch off charging digitally), then it could be another fault elsewhere that knocked out the power to the input relay. On Elcon chargers, the common failure mode is an electrolytic capacitor going high internal resistance from age, and it's protecting the main MOSFETs from switching transients. One MOSFET pair shoots through, shorting the DC bus, which causes an overload and also knocks out the power supplies, so the input relay opens. On a 2 kW Elcon, the parts to fix all this comes to well under AU$100. It might me a little more for a 3.3 kW iMiev charger, but still way less than AU$4000. Unfortunately, it takes hours of labour to do all this, and this is with a schematic diagram of the charger, and a web page with repair tips. But maybe the iMiev chargers are better protected, and it's mostly the pre-charge resistors that blew. We just won't know until further investigation. 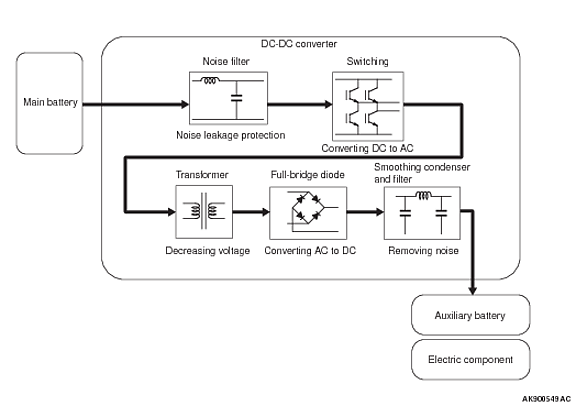 I'm a total iMiev noob, so I have no idea what the availability of schematic diagrams for things like the charger/DC-DC module. Are they available? Howdy Mike, no schematics yet, but Paul is on this forum also [piev] and we might have to trace it out and draw it up for another round of schematics and troubleshooting/repair. So far it hasn't been necessary, but e-pusher's issue may require it. i think one of those big white ceramic resistors is part of the EMI filter, and the other is for by-pass or pre-charge such as the 150 Ohm parallel pair in the TCCH/Elcon. 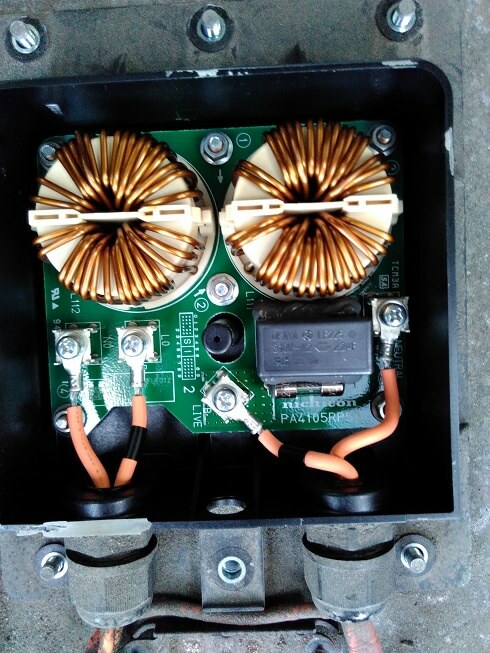 In addition to the internal surge suppression on the top board, and the EMI filter in the relay doghouse on the bottom board--externally bolted to the top of the charger is another input EMI filter with an X2 safety cap. It is actually the first filter since the AC mains from the EVSE comes thru this board before entering the charger. Hopefully that will raise your moderate impression a bit toward the next level. This is a picture of the dc/dc board in the bottom-most plenum of the charger box, located underneath the coolant plate. The fat pink and blue wires are the HV to/from the top plenum, seen on the top edge of the bottom board photo (upthread). The big fat white wire exiting after the 125 Amp fuse is the B+ routed to the positive terminal of the 12V Aux (starter) battery. There is also a smaller S (Sense) wire to the aux positive. 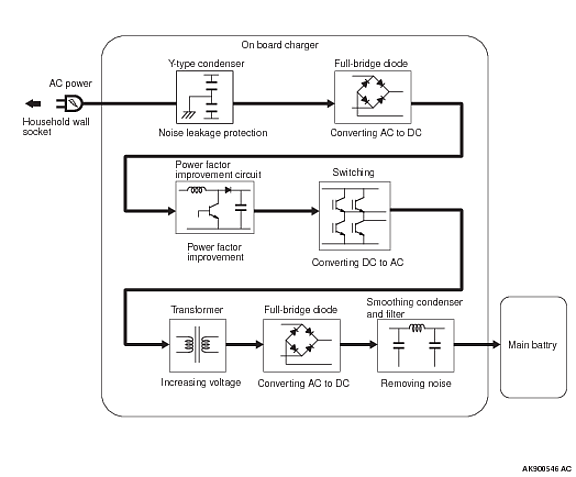 Here is a top-level block diagram from Mits showing the charger flow, but it doesn't show the external EMI, surge suppression or relay. And one for the dcdc converter. These little cars are a blast to drive, you should grab one up if you can. i drive 50 to 60 miles everyday on a single charge and they are perfect for commuting. I didn't realise that the DC-DC was in a separate compartment. I assumed that one transformer was for the charger, the other for the DC-DC, But I see that the DC-DC transformer's output is copper ribbon, needed for the high current. So what is the second transformer for in the charger box? There is only one in the block diagram. Perhaps there are two identical charger units in parallel, each with its own transformer, IGBTs, etc. I'm glad to see that the DC-DC main switches have 0.2" spacing leads. The Elcons' MOSFETs are 0.1" spacing, and it's too easy to get a leakage from drain to gate, in my opinion.